This event was so fun to cover and since them I have very much enjoyed these monthly art gatherings. Jane Ann Clemens was the artist I covered, and I still can't believe she had never shown her artwork before. She has such amazing talent. One of the featured artist in this months First Friday Felton Art Walk was Jane Ann Clemens. She has taught classes before but never shown her artwork publicly. Mediums she works in range from altered books, collage, color pencils, glass mosaic, photography, and water colors. What drew me to her artwork was her focus on the book arts and recycled materials, as well as poking fun at the naughty side of life. Her greeting cards are $4 each and her altered books are $15 each. The cards that caught my eye was a series she made from a 1957 Sears catalog. On the outside is a well dressed gent or lady and on the inside is a similar looking model in undergarments. In a similar fashion she has a book series called Quirky Plant People which includes the regular edition and the abridged edition suitable for children. The series sells for $25 or you can buy the books separately at $15 each. Sayings inside the book range from things like “little sprout” to “pickle in my pocket”, and they are all executed in a fun vintage way. Besides being a wonderful artist she is also a great teacher. In her classes she focuses on inspiring and teaching you to make your own original art, not just copy her class examples. Previous class topics have included animal guides and nourishing your positive energy. She has also created many personal shrines out of small mint tins and in the future may teach a class on how to make a personal shrine for a loved one that has passed. She was the featured artist at Mountain Spirit, which has been participating in the event for eight months now. 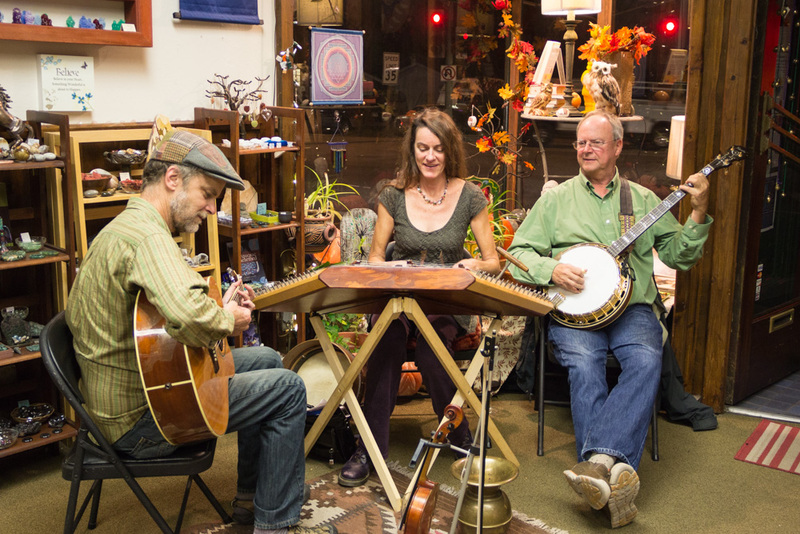 During the art walk they have live music by The Crooked Road Céilí Band, astrology readings by Laurie Twilight, light refreshments and of course that months featured artist. Since February, Felton has been having a First Friday Art Walk every month from 6:00pm – 9:00pm. Originally there were three stores participating but it has now grown to seven stores along Highway 9, four of which have a featured artist each month. It’s also aligned with First Friday Santa Cruz which was founded by Santa Cruz Institute of Contemporary Arts. I highly encourage you to attend next months First Friday Art Walk on December 5th and find an artist that inspires you. Remember Christmas is just around the corner. For information on featured artists visit https://www.facebook.com/FirstFridayFelton .